The time has approached, again, to implement a new lifestyle change as part of our Year of Positive Change, 2013. After introducing wholemeal products and giving white the flick in Term 1, we upped our protein intake by including it in each meal in Term 2. Sticking to our changed habits is an important part of permanent, positive, healthy living. A lot of you guys have noticed a huge difference on your waistlines and energy levels by sticking to these two simple lifestyle changes. It has only been a few months, and to have a noticeable difference in that time shows the positive impact it will have when you stick to it for the rest of you lives. Short term challenges and quick fix diets may work in the short term but are certainly unsustainable for life. We have one unique client at the moment who is on this short term unsustainable journey and getting amazing results, but their challenge will kick in when they go back to the reality of normal, but healthy eating (not eating like a rabbit) and sustainable exercise plans (6 workouts a week instead of 18). As fitness professionals it’s our job to support and ensure that this person is educated on the what, when, how and why of healthy sustainable living. It’s one of the things we pride ourselves on here at Crabtree Fitness. I guess the heading gives it away, but this term we will be concentrating on introducing healthy fats and reducing or eliminating saturated and trans fat from our diets. 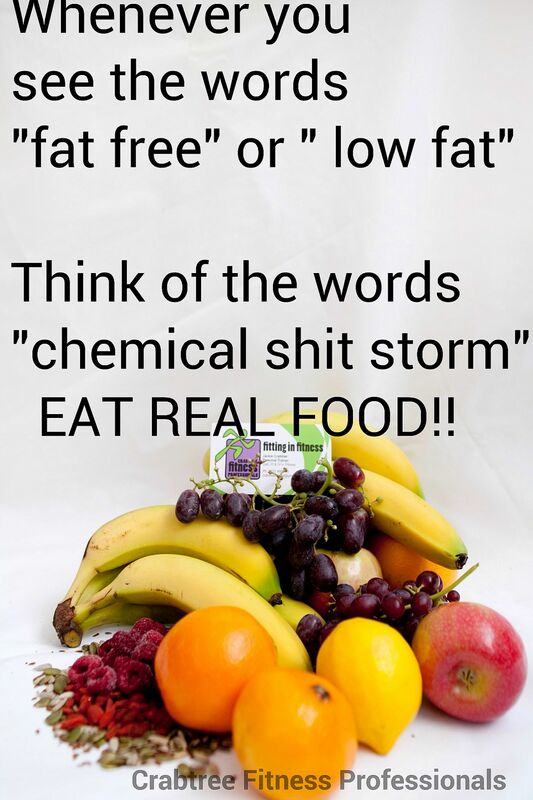 We need to be aware that the media and food companies still roll with the “99% fat free” band wagon when trying to promote their sales pitch for a product to make it sound healthy (even if it’s full of sugar and salt). Fat free isn’t necessarily healthy, unless it’s a carrot or some other form of vegetable. The Natural Food Company’s lollies that are 99% fat free ARE NOT a healthy choice. Fat’s are essential for digestion, vitamin absorption, hormone production and immune health. Fat is also a fuel source (as well as carbs) for working muscles during exercise. Fats are the building blocks for cell walls and hormones, transporters of vitamins A, D, E, K and essential for bone and immune health. Inadequate fat stores and intake can lead to major health complications. Mono-unsaturated oils and omega 3 oils are anti-inflammatory to the body and can help the fight against diabetes, cardiovascular disease, help lower cholesterol, reduce high blood pressure, nourish the immune system and reduce symptoms of arthritis and depression. Good or healthy fats are associated with a longer healthy life. Top of the list in healthy fats are olive oil, sesame oil, macadamia nuts, avocado, flaxseeds, pepita seeds, chia seeds, sunflower seeds, walnuts and almonds. Remember to always keep an eye on portion size on good fats because they contain 9 calories per gram as opposed to carbs and protein which contain 4 calories per gram. Also, when cooking with oils always use the spray versions, as when heated to about 800-1000 degrees the chemical structure is changed and these oils become trans fats! Add your olive oil or sesame oil at the end of cooking to get the health benefits. Fish and chips, McDonalds, Red Rooster, Hungry Jacks, Pastries, Pizza, Cakes and biscuits (unless you make them yourself) DO NOT contain good fats. They are loaded with saturated and, worse still, trans fats which stay in your system for ever. Please try and minimise the use of these products from your nutritional regime. 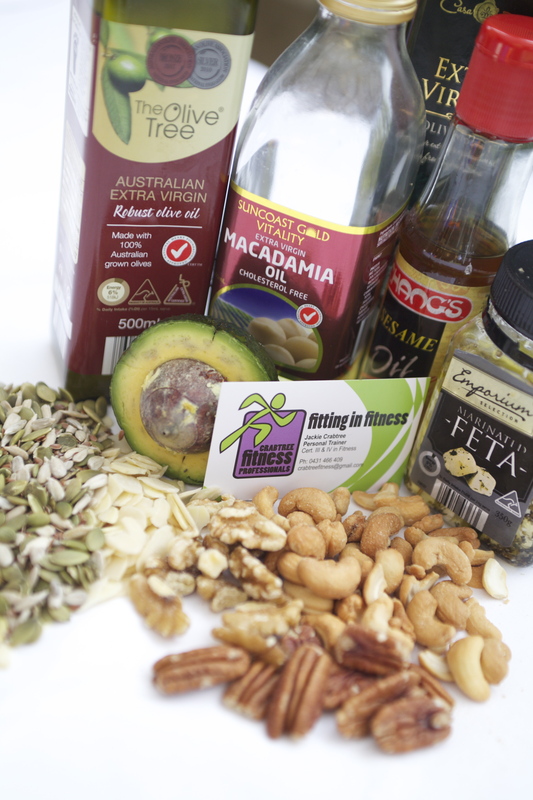 I will be posting some recipes that include these healthy fats over the next few weeks to give you some fresh ideas. Let’s embrace this and contribute to our already healthy lifestyles. Also this term a reminder that we will be taking measurements for anyone wanting to keep track of their fat-loss for the term with the added motivation of a special prize for the most fat lost. And fitness freaks will be included with the best improver on the outcome measures for the term. Term 3 will kick off with 2 new sessions this week. Monday afternoon Mum’s Group at Buninyong Footy oval at 2.15pm and our early morning boxing session at 6.15am on Tuesday morning (don’t forget to see Matt at SportsBiz for you inners before then). Speaking of SporstBiz, Matt is organising to open his doors for an invitation only open night for Crabtree Fitness Professional’s clients and families with 20% off storewide. It will be at 6pm on Tuesday the 23th July for one to two hours. The invitations will be out soon, so hold off on buying your new gear for now. Bring on Term 3 and let’s make it count! !